The Belgian tradition of culinary invention and improvisation, combined with a love of hospitality, has resulted in an interest in finding the perfect match between beer or cider and food, a science they call Cusine À La Bière. Pairing beer and cider with food is much like pairing wine with food, some people prefer pairings of similar flavors while others enjoy contrasting veins of flavors. “There is no wrong choice when it comes to personal pairing preferences,” says Diane LaVonne (pictured above), chef/owner, Diane’s Market Kitchen in Seattle. 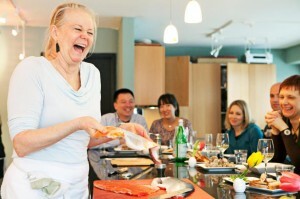 She will present tasting sessions at the Seattle Food and Wine Experience at the Stella Artois Bistro and Chef Stage. Her presentation will tackle the notion of pairing beer and cider with food and take the concept well beyond pub food. The regional and seasonal dishes, using or paired with International beverages, include short ribs braised in dark ale. Another recipe pairs carrot cake with an elegant glass of hard cider. Attendees will learn how to create these dishes and taste each ingredient. Americans are now discovering what Europeans have known for centuries. Beer and hard cider go well with a variety of dishes. Flemish food, found in Dutch-influenced northern Belgium, features hearty, rich and satisfying dishes made with almonds, dried fruit, nutmeg and saffron. In French-influenced southern Belgium, Walloon cuisine features some of the world’s most famous chesses and yeast-raised Belgian waffles and pancakes, as well as rich Belgian chocolates. The best of Belgium is being presented at the Seattle Wine and Food Experience courtesy of Stella Artois. Four taps will flow with Hoegaarden, Leffe Blonde, Cidre and Stella Artois for tasting. Stella Artois was originally brewed as a holiday beer. It was so well received, it became available all year. Six hundred years later, its long tradition continues from Leuven, Belgium. Stella Artois has exceptional clarity and an earthy Saaz hop character. It is brewed using only the finest of natural ingredients, including a unique Belgian yeast strain – a cherished secret that has been kwpt for years. The crisp, refreshing essence pairs well with intensely flavored Thai, Asian and Indian dishes. The bitterness and light body also help cut through and contrast cream sauces in pastas and semi-soft cheeses like Harvatri and artisanal cheddars. The village of Hoegaarden has been a seat of brewing since the middle ages. By the end of the 19th century, the village of 2,000 inhabitants boasted more than 35 breweries. The hallmark white beer has a refreshing flavor and spice from Curaçao orange peel and a hint of coriander. The unfiltered, cloudy white beer with a thick, frothy head pairs well with salmon, white-fleshed fish and salads. Enjoy it Belgium style with “moules et frites” (mussels with shoestring fries). Monks began brewing Leffe Blonde in 1240. The dry and fruity style, similar to red wine, has a delicate bitterness making it perfect to serve with meat and chocolate desserts. 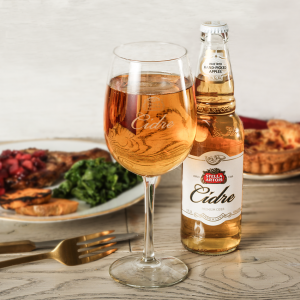 Stella Artois Cidre is deliciously served in a wine glass with creamy and sweet oysters, grilled with an apple slaw, or a crab sandwich. Chef Diane LaVonne will be at the Stella Artois exhibit to demonstrate the tasty pairings of beer and cider with food during the Seattle Wine and Food Experience.